Daniel is such a good guy at all times, he is amazing. He dresses well, smiles, is supportive of his wife and children. The new hair style is much better. His latest tux had one of the best fits I have ever seen on a man; he looked very elegant and dapper. Congratulations, Daniel! What a coincidence - I have to smile, maybe even laugh a little as well. I am in a production of 'Mamma Mia' which opens in early May. I just returned from a 3 hour rehearsal and saw this, lol. Maybe if Victoria and Daniel and Estelle like Abba as much as I and the rest of the cast do, they will travel to my country and see our production. Yes I know... just wishful thinking of course, but imagine...wouldn't that be cool? lol! Did you know that Dancing Queen was published to honor of Carl Gustav and Silvia´s weddings at gala on TV day before the weddings. Also Frida from Abba is one of Silvia´s best friends. Frida is also today a princess, she is Princess Reuss and Countess of Plauen with the style of Her Serene Highness. Thank you Blondiini - no, I didn't know that, but that is a fun and interesting fact for sure. I have been a big fan of the band since my early teens. Nice outing for Estelle. 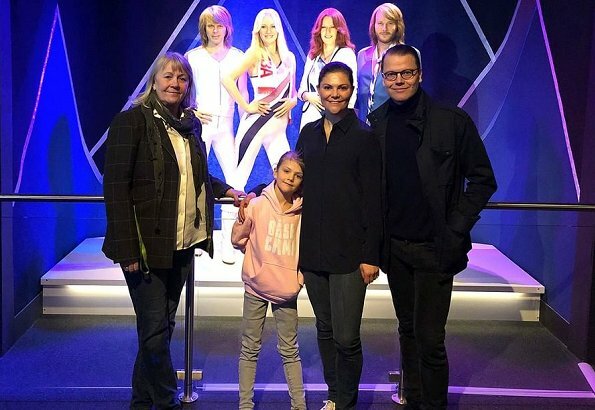 Victoria looks lovely in this casual outfit, Daniel looks good, Estelle really grew a lot.Well I see Abba is still around, nice to know.